John is the Senior Partner in the firm. Prior to joining the firm in 1973, John worked as a Solicitor in the Chief State Solicitor’s office. 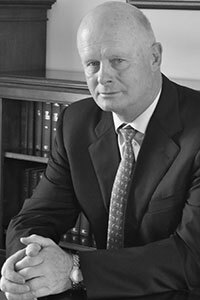 John was State Solicitor for Limerick County from 1993 until his retirement from that office in 1999 during which time he conducted prosecutions in the District and Circuit Court on behalf of the Director of Public Prosecutions and various Departments of State. John advises a wide variety of commercial and private clients and he represents clients in all courts as well as at tribunals, arbitrations, inquiries and other forms of mediation. John’s specialist areas of practice include the agri and equine sectors, sports law, commercial law, Industrial and Provident Society law, personal injury and professional negligence litigation.